Nouns / phrases: Sun, summer. Warmth, heat. Light, shine, glow. Brightness. The visible, clear, and obvious. Lack of depth; shallowness. Appearance. Day and daylight, waking state. Awareness, consciousness. Happiness, joy, celebration, vacation. Emission, transmission, a strong broadcaster, charisma. Popularity, fame, success. Extroversion, enterprising spirit, confidence. 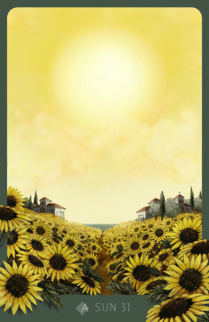 Also: the Sun might lessen the depth/significance of neighbouring "negative" cards. Activities: To heat, warm (up). To shine, glow. To light/brighten (up). To throw light on X. To spend a day with something/someone. To wake (up). To be aware or make aware, to be conscious of. To enjoy, have fun, celebrate. Possibly: to go on a vacation. To emanate, radiate, broadcast. To succeed, to be confident about X. To not hide one's light under a bushel. To keep up appearances. Attributes: Sunny, summery. Warm, hot. Bright, light, brilliant. Shiny, glowing. Visible, clear, obvious, superficial, apparent. Awake, aware, conscious. Easy, happy, joyful, merry, celebratory. Charismatic, popular, famous, successful. Confident, extroverted. As a person: Person with the above attributes, especially: a happy person. Person who is your sunshine. Sunny person. Someone who broadcasts something very strongly. As advice: Be happy (about it)! Always look on the bright side of life! Don't hide your light under a bushel! Take a day off! Negatively: Don't ignore the dark sides of life! Look below the surface! Time factor *) : When it's obvious. Day(time), and more specifically noon. Summer. See also the annakblogs article >> So, is the Sun a positive card?